What we walked: 138km (with a couple of kilometres spent just finding coffee). 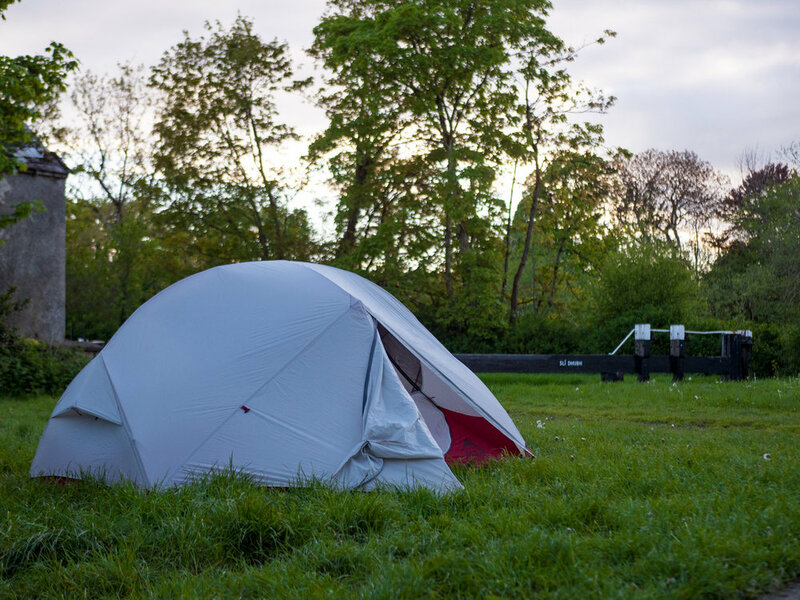 Camping/Accommodation: Camping along the canal is always incredibly easy and enjoyable. The towns along this trail are also pretty perfectly spaced for those who want to book accommodation along the way. 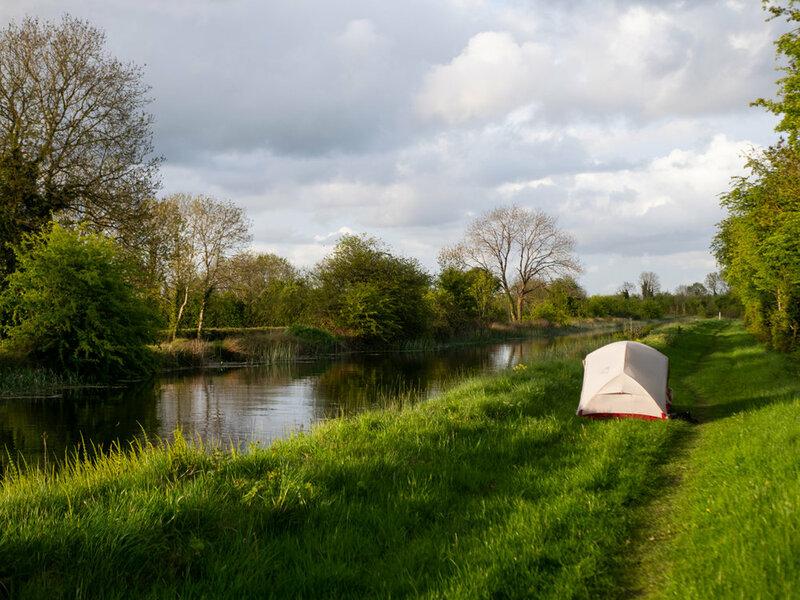 In our list of National Trails, there are 3 major waterways we walk; the Royal Canal Way, the Grand Canal Way, and the Barrow Way. Having done the first two and found them to be nice, but definitely not what we would call hiking trails, our hopes for the Barrow Way werenâ€™t high. However - I am more than delighted to say that there was nothing for us to worry about. At a little over 120km in length, the Barrow Way featured almost entirely grass banks and perfectly spaced towns. Itâ€™s amazing how having purely grass banks to walk along it felt like we were actually walking along a river bank. On the first two canals it felt like we were walking on roads with water beside them, which meant we spent more time focused on how uncomfortable the road walking was than on the canal itself. When walking the Barrow Way on grass, the landscape was vibrant and alive. We saw and heard so much wildlife, enjoyed the powerful, thunderous weirs and the silent sun dappled bends. Our first day we saw mostly clouds, and we wandered along the bank slowly. This wasn't our first time walking this stretch of banks - for my graduate project in college I walked from my apartment in Dublin to my family home in Tipperary. That was over 2 years ago, and with different deadlines I knew this trip would be different. It did provide a few surprises - I'd look over my shoulder and instantly recognise that specific view, but looking around myself in general I had no memory of the place. 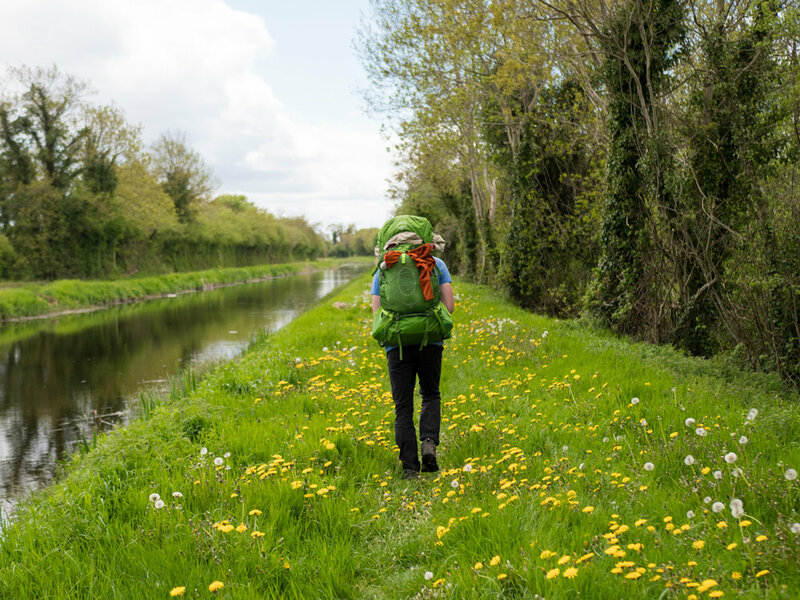 We walked that day to just before Monasterevin, camping on the side of the canal. It was still early evening when we stopped, but we were both surprisingly wrecked. Once we'd set everything up, we went for individual walks to have one final stretch and just scout out the area a bit more. I met a local farmer on my stroll. He used a white pigtail post as a walking stick, his boots well worn but still sturdy. He was walking out along the canal to see some of the work being carried out on a closed, flooded quarry. He told me that many years ago, when the quarry was working, they dug too deep and hit an underground river. That river had been feeding all the local wells, which consequently all dried up, leaving most people with no water. 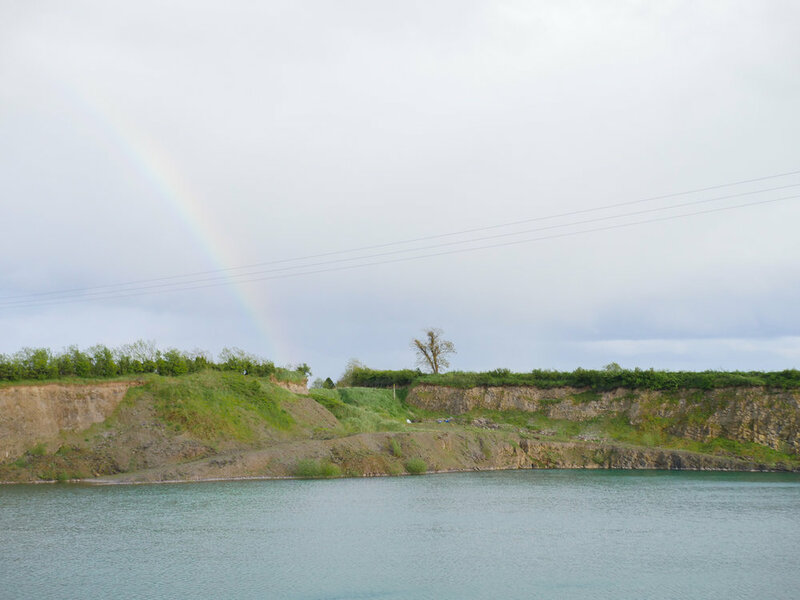 Not long after the quarry was closed, and now the shining, alluring waters there are hundreds of metres deep. For over a year now, trucks have been coming daily with loads of rubble, pouring it into the turquoise depths, trying to fill it. I remember seeing the quarry two years ago and it looked exactly the same. He told us about a better camping spot not too far down the banks, but we were too tired to move everything. We had a short walk into Monasterevin, but then spent quite a while looking for coffee. We eventually settled on a petrol station with decent sized seating area. I think we spent over an hour sitting there, slowly drinking our early start away. We eventually got moving again, crossing bridges and weaving along the canal out of the town. There was sunshine and grass, and by about early evening we reached Athy. We went looking for food, and made one of those mistakes when you can't decide what you want, walk around the whole town, and end back at the chipper you started this search at. Those burgers were good. Did you know that there's a state of the polar explorer Ernest Shackleton just off the river. Turns out he was from Athy! It was unveiled a century to the day after Shackleton rescued the crew of his ship Endurance from Elephant island in the Antarctic ocean. The bronze statue is an impressive towering figure, surveying the land ahead of him. It feels fitting, having seen the statue for Tom Crean in Annascaul on the Dingle Way. Not wanting to camp too close to the town we set out towards Carlow. There are a series of interesting looking bridges as you exit Athy - if memory serves me correctly, until roughly Athy the banks we're walking along are purely canal banks, and the actual Barrow River is weaving itself along past the far bank. At Athy, the two combine, and we're now walking along navigable river. What this means is that the main body is the river, but whoever there's a weir (or similar river feature), boats can take a separate channel to the left and go through a series of locks instead. We walked slightly further than we planned, but found a quite empty canal section, that even had a bench! The day before had been blissfully sunny, but the forecast was for rain starting early morning. We packed up and were walking by 7am. And then the rain hit. It was torrential, intense, wet. Thankfully, by walking further the night before, we'd unintentionally made an extra short day for our day 3. Arriving into Carlow at about 11:30, we went to the B&B we were staying in that night. It was very early to arrive, but all we needed was to drop our dripping bags. Thankfully our hosts were wonderful and let us deposit our belongings early. We went and found coffee two doors down and listened to the rain. Carl met up with some people he knew from going to college here, and I wandered around the town, finding more coffee and getting laundry done. Collecting the laundry that evening ... I realised I'd forgotten to tell the woman that my socks are all wool. Out of my 3 pairs, two I managed to stretch out again, but one of them had to be retired (it took a week of me trying to stretch them out before I admitted defeat). What I didnâ€™t expect to happen - and has never ever happened to me before, no matter the country Iâ€™m hiking in - was that my scalp got sun burnt. And let me tell you, a peeling scalp is not a pretty sight! I spent that evening picking flaking skin out of my hair. The easy day before had done wonders, and we set off again in some beautiful sunshine. We came across magical entrances to manors long overgrown, and walked underneath majestic train bridges that reminded me of ancient aqueducts. We weren't alone in enjoying the beautiful scenery, meeting dog walkers, family ramblers, and cyclists. The river has clearly been a hub of activity for a long time, with many mills at varying stages of use and ruination spaced along the waterside. It's interesting looking at it now - when industrial at one point, the high hump back bridges and old brick walls had now attracted fancier owners, with some expensive looking gardens and homes backing onto the Barrow. It never felt like we weren't allowed to be going the way we were, but home had clearly extended to the banks so that they could enjoy the water more. Slyguff is going to go down as one of my favourite camp sites. The ruins of an old lock house are nestled in tress and ivy, the usual two gate lock creating a gentle, cacophonic rumble that drowns out any unwanted noise. A metal picnic bench stands alone in what might once have been the lawn of the abandoned lodge. A barge sits in the water, swaying to the movement of the water around it. We're alone, and sit for a while before setting up, munching chorizo and caramel biscuits. The tent is up, and I'm laying out the sleeping mats. I hear Carl talking outside and stick my head out. We have a great conversation with a man who used to work with Waterways Ireland - he's still wearing the pants, but has the pocket flaps tucked in to hide the logos. We've never met an unfriendly Waterways Ireland employee, and we talk for quite a while before he decides to carry on with his walk. Talking to locals after we've pitched up for the evening always makes us feel even more welcome. It was a quiet night. We ate half a carrot cake for breakfast. We weren't sure where we were aiming for that day. 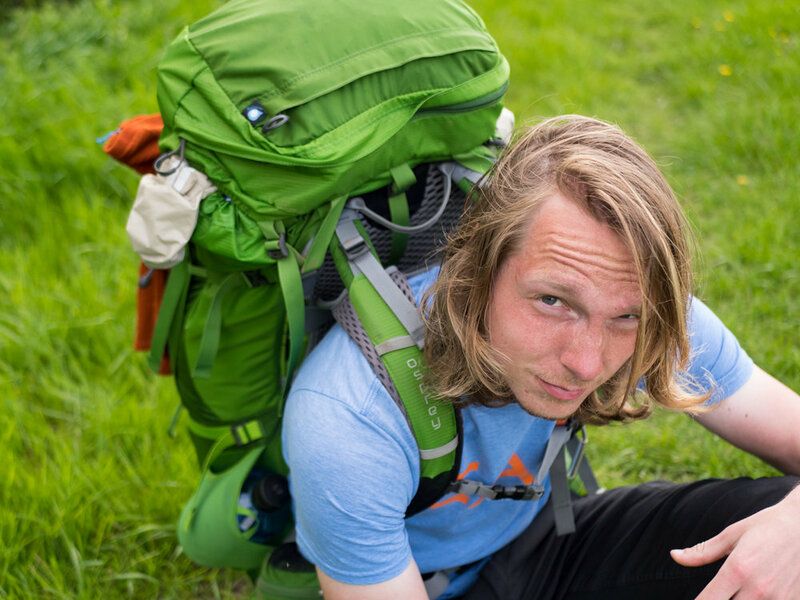 As we stretched our legs before fully packing up, another walker arrived at our camp. An American guy with a bag bigger than himself (and I say that knowing we can't say anything), we had an awkward conversation, before he kept trudging and we resumed packing. I don't know if it was us, or him or just the general lack of coffee on everyone's part. As we walked this trail we met countless people who would tell us that we still had the best part ahead of us. And while the opinion of where the exact amazing spot was differed from person to person, the general consensus was Graignamanagh. I'm not sure if it was a process of us just enjoying the people and the walk more and more as we went; or if the trail did actually get nicer. I'm willing to guess it was a bit of both, and that last day certainly was spectacular. 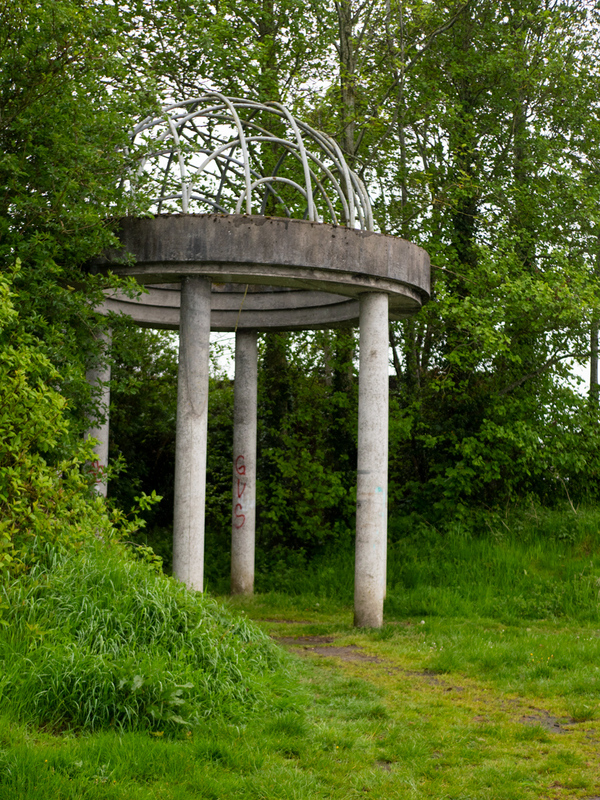 It reminded me of the Nore Valley Way, a very short one day trail we'd done in Kilkenny. Huge banks of trees rose up the valley sides as we went with the bends in the river. Sunlight streaming, it brought the thousands of shades of green to life and the land shimmered with colour. It was great. 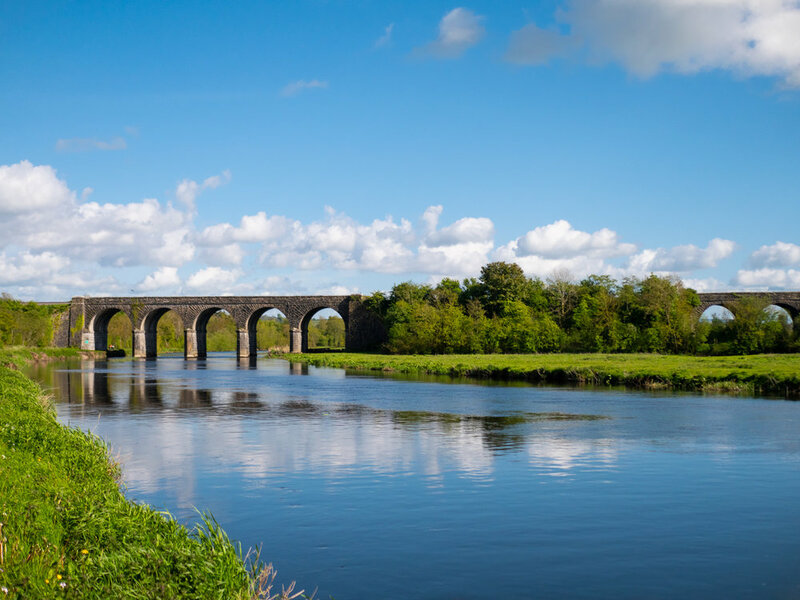 I guess it's not surprising that the river Barrow reminded me of the river Nore - they are two of the three sisters, the river Suir being the last. All three rivers feature on a trail, and they all have a similar sense of presence and power. We'd often wondered on our way down the Barrow why the trail didn't extend the whole way down to the river's mouth. Surely it would only be an extra day or two to make it the whole way down. It was during our conversation the night before at Slyguff that we'd learnt the reason why. The canal of the river barrow ended at St. Mullins, because from there on the river was tidal. The river was navigable by larger boats from there on, but the tow path went no further, and therefore our trail went no further. The physical final lock is actually a short walk before the tiny village of St. Mullins, and we took a short break there in the evening sun. Unfortunately, Carl's knee had started acting up during the final 40-50km of this trail. He had problems with his knee last year after the East Munster Way which we'd tried to ignore. By now we've learnt how to understand and deal with the different levels of niggles and pains. These aches required some rest, so we decided to take the next couple of days off. 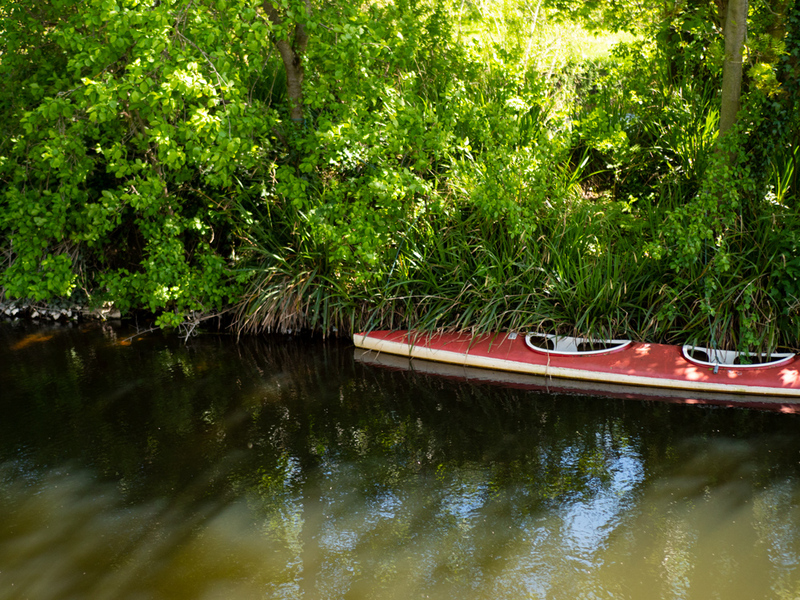 Itâ€™s also possible to kayak the waterway - we saw a few different companies offering the service, where they drop the boat to wherever youâ€™re starting, and collect it at the end point. It was a really great walk. 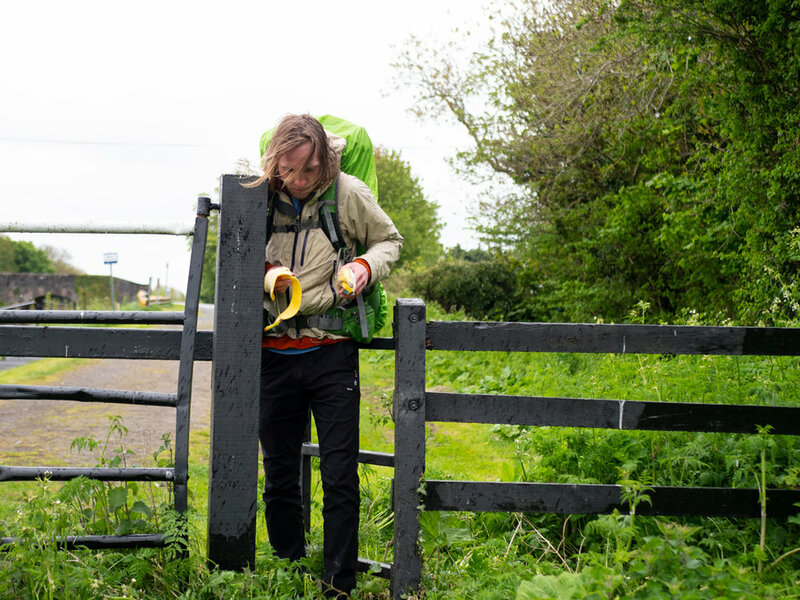 It was also incredibly easy to camp along - lovely flat locks in the middle of no where, with no hope of someone walking past in the middle of the night. It gave us the feeling that we were back in control of the trails (as silly an idea as it is), and definitely gave me a new lease of trail life. There's nothing challenging to this style of trail, and would be a great place to go gain some walking and camping confidence. If you're looking for an enjoyable relaxing stroll, you have found the trail you were looking for.